After the incredible cinematic triumph that was Night Watch, the anticipation was high for the second adaptation in the trilogy written by novelists Sergei Lukyanenko and Vladimir Vasiliev. (But the 2nd and 3rd chapters got fused into this one movie). As with Night Watch, the Russian flavour, intellectual approach, style and locations contribute to making it unlike any other cliché movies churned out by the Hollywood machine. In Night Watch, Anton caused an imbalance in the pact between the dark and light forces when approaching a witch to terminate his unborn child. With his son growing up, he loses him to the dark side. While the politics and underhandedness continue between the light and dark forces, Anton tries to save his reluctant son, but is framed for the illegal killing of Dark Others – part of a plot to enshroud all in darkness and have the vampiric ones rule. This absolutely splendid, detailed and unique cinematic experience does not disappoint as it blends so many levels, from foreign art film and drama to action / horror / fantasy themes. 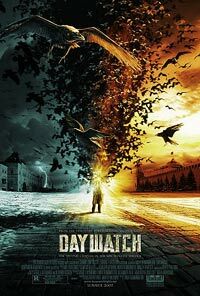 If you haven’t seen Night Watch, get it now, then dig into Day Watch. So, we won't need to twitch for the final chapter’s release, as this is where it ends.